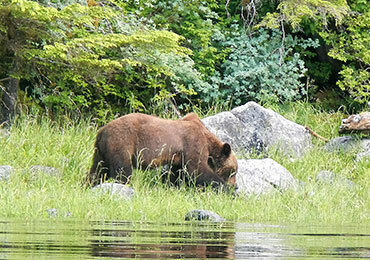 Baranof's wildlife viewing private charter options. You may have already heard, but Alaska has a lot of critters. 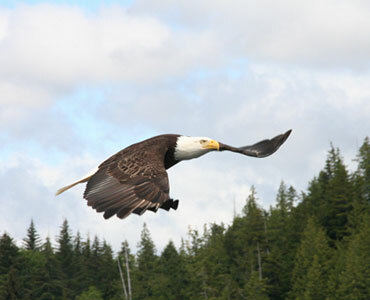 The Ketchikan area is replete with animals, large and small, on both land and sea. Black bear viewing is a popular attraction, and is often combined with a floatplane trip to a local salmon hatchery stream where bear line the banks. Whale watching can be had on the outer coast of Duke Island, where humpbacks congregate throughout the summer. Birds of every kind abound as well; from seabirds to bald eagles, summer in Southeast is famous for avian activity. Whether your interests lean towards the beasts of the field, sea mammals, bird watching, or just all fauna in general, a wildlife viewing excursion in Southeast is sure to be a unique and rewarding experience. There are any number of options available to customize your wildlife viewing experience. In planning your trip, let us know what your priorities are, and what you'd like to see when the opportunity presents itself; we'll take care of the rest. Baranof has several options to choose from when it comes to your private charter vessel, each uniquely suited to different kinds of wildlife viewing. 30 ft. Cabin Cruiser - With a galley and head, it's hard to find an excuse to get off the boat. Perfect for whale watching away from shore. 24 ft. Cabin Cruiser - Our standard vessel, these boats provide a cabin for getting out of the weather, but are easily put in at most beaches for a nature hike or wilderness dining experience. Outstanding for a combination tour focusing on sea and land mammals. 20 ft. Skiff - Open skiffs are the workhorse boats of Southeast Alaska. Full freedom of movement from bow to stern makes stopping along nearly any shoreline possible, and their shallow draft allows for poking into areas larger boats might shy away from. Where we find them: Locals see black bear quite often during daily life. Most have had them digging through their trash like a giant raccoon, and they're also spotted regularly at landfills. 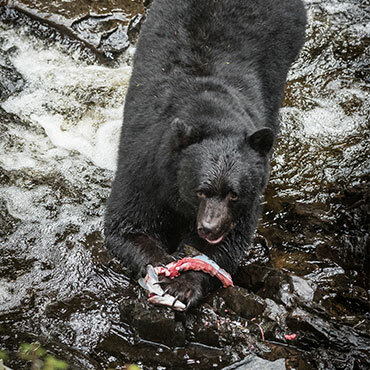 During the summer months, active salmon streams will be thick with black bear adults, along with their cubs. Range: Throughout Alaska, except the southern-most islands in Southeast and the Aleutians past Unimak. Where we find them: Not normally found on the same island as Ketchikan, though sightings have been reported. They can be spotted across Behm Canal in the Misty Fjords, so planning on a tour of Rudyerd Bay with emphasis on finding some brown bear makes for a good day. Alaska Population: 160,000 in 1993 and increasing. Range: Yukon-Kuskokwim Delta to central California. 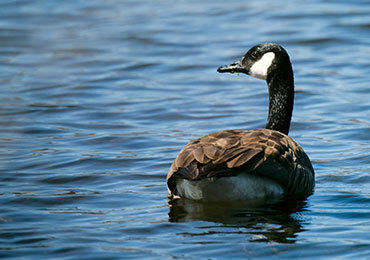 Where we find them: Primarily feeding off ground vegetation, these geese can be spotted in marshy areas and muskeg. Estuaries and riverbanks are usually a good bet. 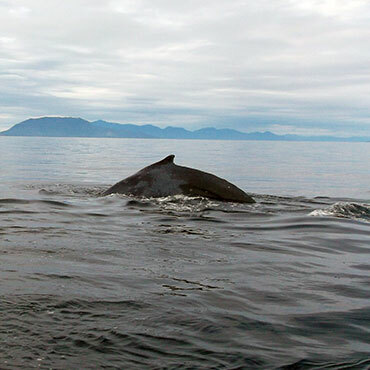 Where we find them: Dall's porpoise are a common sight out of Ketchikan, and can be spotted on any maritime excursion. 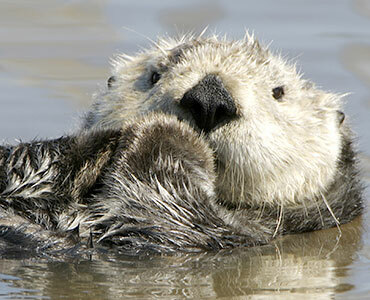 Very fast swimmers, they'll sometimes be found bow-surfing a boat's bow wave, or trailing behind in the propeller wake. 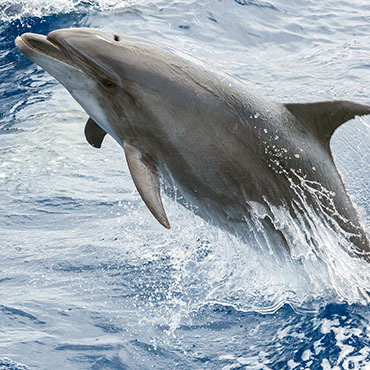 Where we find them: Pacific White-sided dolphin are most common in deep, offshore waters, but can be found over the continental shelf and close to shore in some areas. As such, sightings are more random, with no definite location to plan on spotting one. Range: Throughout Alaska, with densest population in Southeast. 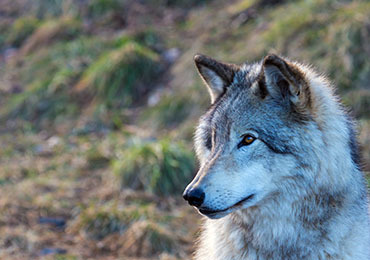 Where we find them: Wolves are transient animals and sort of just show up anywhere. There have been times when packs were roaming close to town and pets started disappearing. During the summer months they can be found on beaches and near streams as they feed on salmon that have spawned and washed ashore. Where we find them: Heron can be spotted anywhere, as they feed in freshwater, saltwater, and inland areas. Riverbanks and estuaries are solid locations, though you may see one as you're boarding your boat in the marina. 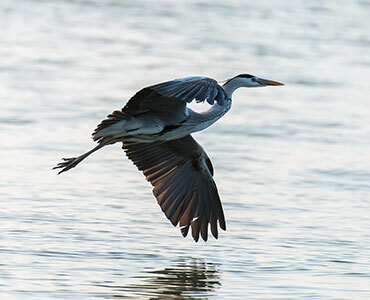 Anywhere land meets water stands a chance of having a heron strutting around. Alaska Population: 3000-5000 return to SE Alaska each year to feed. Where we find them: Humpbacks can show up anywhere. It's not uncommon to see them right in front of town. We head out to the coast of Duke Island from Ketchikan if whale-watching is our goal for the day. Range: Throughout mainland Alaska from the Stikine River, up to the Colville River on the Arctic Slope. Rare sightings in Southeast Alaska. 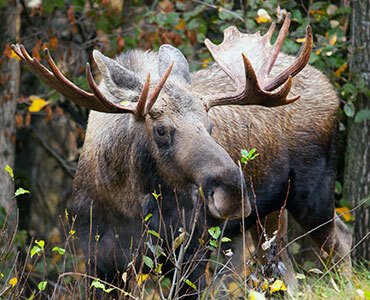 Where we find them: If there are moose around Ketchikan, nobody has ever seen one. 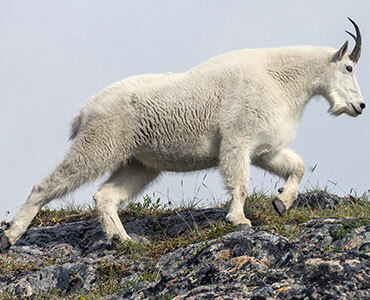 If you have your heart set on seeing the largest member of the deer family, there are excellent tours out of Haines and Skagway to the north that will get you within throwing distance of these behemoths. Where we find them: As the name implies, these animals aren't found down by the ocean. With a decent pair of binoculars they can be spotted along the granite walls of fjords, but, without going for a hike, you're not likely to see many unaided. Alaska Population: No official estimate, though 1000 different orcas have been identified in Alaskan waters. 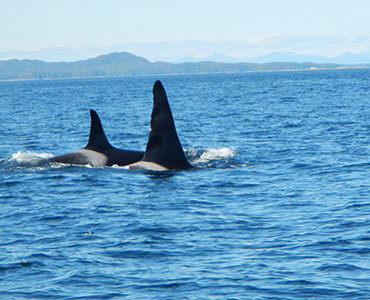 Where we find them: Non-transient Orca can be found anywhere as they hunt salmon. 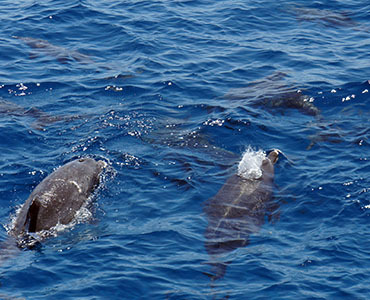 Transient pods can be found wherever smaller marine mammals congregate. Alaska Population: 20 million worldwide, with 27% in North America. 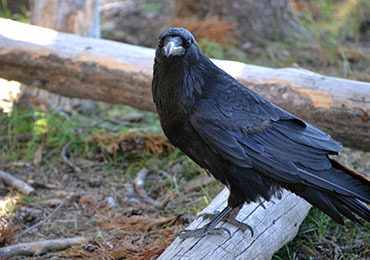 Where we find them: Raven populations increase in areas humans live. They'll get in your trash, or steal groceries out of the back of your truck if you're not careful. Though they can be confused with crows, bird lovers will likely identify a raven or two before they even board one of our boats. Where we find them: Sea lions can be spotted in any bay or inlet, and are commonly found anywhere the salmon are present. 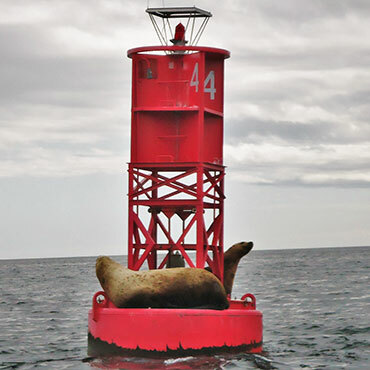 There are some known haulouts where your guide can take you with a very good chance of seeing them out of water, though you may spot them sunbathing on a floating navigation buoy on the way out of town. Where we find them: Sea otters will stay in the same area as long as food remains plentiful, so we can usually find the same ones where we found them yesterday. They spend most of their day eating, as they consume about 25% of their body weight every day to keep their fast metabolism fueled. Watching a sea otter cracking shellfish with a rock while floating on its back is a good use of time when the opportunity presents itself. 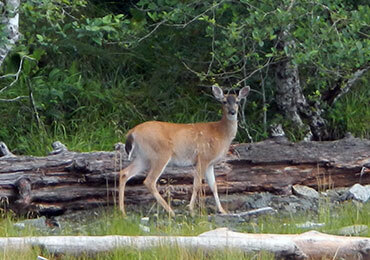 Where we find them: Deer can be found on any island in Southeast. Excellent swimmers, you'll sometimes find them paddling their way between islands. Range: Throughout Alaska including Southeast except Admiralty, Baranof, and Chichagof islands.